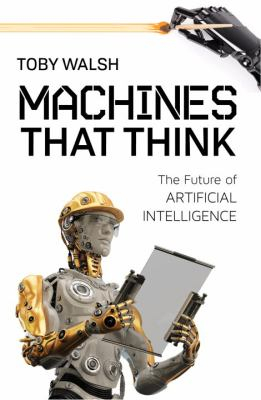 Machines That Think : The Future Of Artificial Intelligence - ubiq bookshop: the best place to buy books! A scientist who has spent a career developing Artificial Intelligence takes a realistic look at the technological challenges and assesses the likely effect of AI on the future. How will Artificial Intelligence (AI) impact our lives? Toby Walsh, one of the leading AI researchers in the world, takes a critical look at the many ways in which "thinking machines" will change our world. Based on a deep understanding of the technology, Walsh describes where Artificial Intelligence is today, and where it will take us. - Will automation take away most of our jobs? - Is a "technological singularity" near? - What is the chance that robots will take over? - How do we best prepare for this future? The author concludes that, if we plan well, AI could be our greatest legacy, the last invention human beings will ever need to make. Toby Walsh is one of the world's leading experts in artificial intelligence (AI). Professor Walsh's research focuses on how computers can interact with humans to optimize decision-making for the common good. Featured in the December 2018 Humanities newsletter. To receive this newsletter regularly please email us with your name and contact details.